It’s hard to believe it has been over a year since the first swimsuit release from Patterns for Pirates. 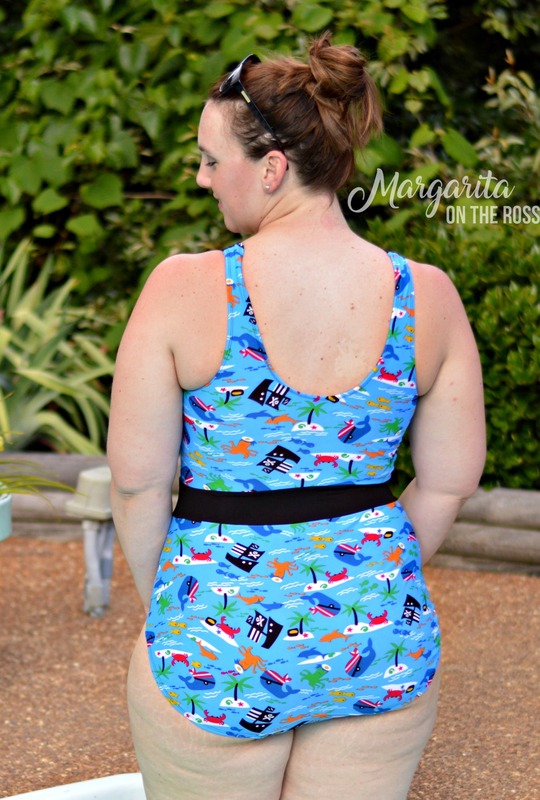 Judy made this classic swimsuit pattern to flatter all body types. The Take the Plunge Swimsuit. The P4P team has been hard at work behind the scenes creating and perfecting this beautiful one piece addition to the swimsuit line. Take the Plunge has 3 strap options and 3 bottom options. During testing, I set out to make as many different versions as I could. I started out with the high back option with the regular bottoms. I had bought this fun swim print to make rashguards for my boys (from Hancock’s closing sale last year), and I decided that it would be fun to have Mommy and Me swim attire. Hey, I have got to do it while my boys are still young! So I ended up with a pirate themed one piece! The gathering on the cross over bodice pieces was a little challenging to construct, but it was well worth it for the final look. I had to lengthen both the straps and the bodice pieces (per my usual pattern adjustments) because all of my height is from my shoulders to my natural waist. With the waistband hitting at the natural waist, it creates a slimming effect through the midsection. The cut of the bottoms is slightly higher than the Hello Sailor bottoms. I feel like this cut is more flattering on my hips. And who doesn’t appreciate full coverage bottoms???? The high back option makes this a great suit to play with the kids in since I have no fear of anything falling out!! I love that my new Mama Isabel cover up coordinates with this suit! The Aztec stretch lace was from Hobby Lobby’s spring line this year. Another reason why I was so excited about the new pattern was the ability to mix and match with last year’s Hello Sailor Swim Bottoms. I made the purple swimsuit last year during testing and knew I had enough fabric leftover for a bikini top from the Plunge (The fabric is from JoAnn last year, but I have seen it this year too!). Similar to the hacks on the P4P blog, I constructed the top as usual and then added elastic to the bottom, turned and topstitched! Now I have two great swim tops to match these bottoms, and I used up some fabric scraps so it didn’t cost me out of pocket to make it. This is the halter version but without the extra straps that Judy showed in the hack blog. This will get a lot of use to even out the crossing tan lines that I will be getting on my back from my other suits this summer. Finally, the last suit I made was my favorite. I finished the suit late the night before the release and got up early the next morning to photograph it in time for the release. Now that is love!! I fell in love with the skirted version during testing so I just HAD to make one. Let me tell you, it was worth the time invested. I had this beautiful Ailani Floral from LA Finch Fabrics that I knew would be perfect to show off with the skirted version. I do not work with swim knit that often, but this is the best quality nylon spandex I have ever sewn with. It is soft but still thick enough to provide good coverage. Showing off swimsuits is nerve wracking enough, especially because I made the decision to avoid photoshopping my legs. Therefore, I might as well show you what’s underneath! The skirted version is still a one piece with the swim bottoms attached with the skirt at the waist. I have had stretch marks on my thighs since high school (thank you for the fast growth spurt both up and out), so I feel the skirt takes attention away from some of my most challenging self image parts. Let me talk about the low back with the tie straps. I thought this would be challenging to make, but it only added 1-2 extra steps from the halter version. The tie back is definitely my favorite of the options. The low scoop in the back makes for a waist narrowing effect. Again, the cross over bodice with the gathering is a nice, classic style that everyone can work with. I really wish I had more of this fabric to make another suit with because it is going to get so much use this summer!! Well, here is to exposing my flaws to the whole world. Hey, being a woman takes a toll on the body, but what better way to celebrate it. Bring on all the Plunges this summer at the pool. Catch the pattern while it is on sale and consider the Hello Sailors and Siren Swim Top to make your whole summer swim suit wardrobe! 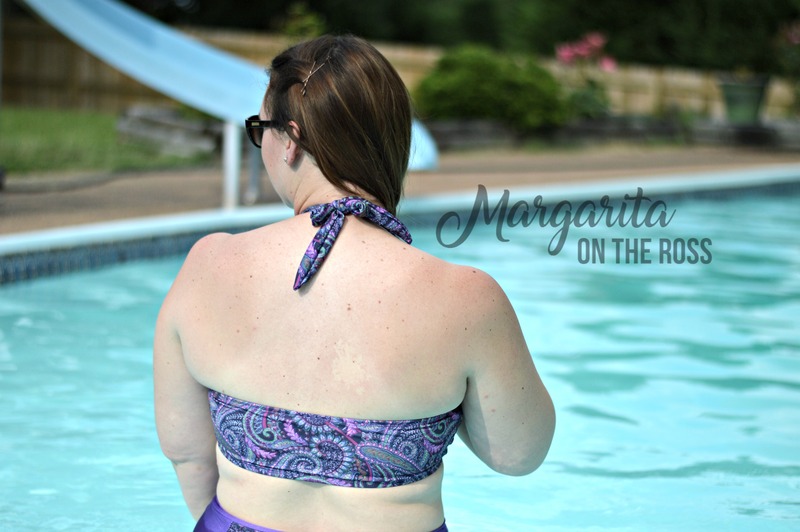 Check out some of my other pool and beach appropriate looks here.